What they say: Geraint of Family Tumen, kereit Halaka, Kypchak Kishyn comes of age in the summer of the Tanaiste, the gathering of all the Dhervina in the sacred valley at the center of the world. It is the summer when he will learn if he is to be accepted as full Dherina, or banished. As he enters the valley, he discovers he has an unusual gift – the ability to hear crystal, an ability usually held only by the femal Guardians of the Dhervina. Unfortunately, he was born a dhavara in a family of normal sized people and into the Dhervina, a nomadic people, who consider dhavaras to be ostuda (bad luck). At the same time, his sister Brys joins the Khutulun, the female-only kereit with far-reaching and shadowy powers. This story tells what happens in the summer of the Tanaiste, how Geraint discovers his Talent and what happens when dreams and fear collide. I received a copy from the author as part of the Goodreads First-read programme! 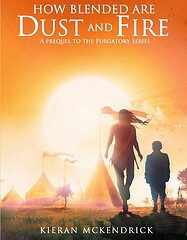 What I say: How Blended Are Dust and Fire is a beautiful story which has the beginnings of a great fantasy saga. As a prequel, the book introduces Geraint Tumen and the story of the Dhervina; they are a cross between magical and spiritual beings. Geraint has a rather unique gift which sets him aside from others of his kind. The book is told from the perspective of not just Geraint, but also several other characters including Seren, Brys, Rhian, Andras and Tegan. This was both interesting because it's always good to get inside character's heads, but at the same time it was often a bit confusing. I also found all the names and terms in McKendrick's new language a bit confusing at first, but you do get used to it (although perhaps a glossary would help for the next book). The story was really touching and I soon found myself engrossed. I really like Geraint, but I kept changing my mind about Seren. The thing which really stands out about How Blended Are Dust and Fire is McKendrick's world building! We're introduced to the strange and wonderful festival and the Dhervina's culture: including a new language and mythology. An important element is McKendrick's analysis of evil. In his world there are MANY different types of evil and badness, and it was interesting seeing it all unfold. It's difficult to go into too many details without giving too much away, but with his world building, McKendrick has nicely set up the rest of the story in this short and intriguing book and I will definitely be reading the series.